A Librarian by Any Other Name – We Have a Winner! A Librarian by Any Other Name Contest Winner! Kelly Jordan of Central High School of Clay County in Lineville, Alabama with her entry, Media Maven. Kelly wasn’t the only one to suggest that title, but she was the first to send it in. Congratulations Kelly! I’ll follow up with an email to get you your prize! Media Center Master (AKA MC MASTER) – sounds like a rapper! More next week! Wear your titles proudly! Discover what your clients need and want – we’ve talked about this one. Offer a great product or service that meets their needs and wants – you’ve got that covered! I have effectively marketed my business using four very “sticky” ways to get the word out. The first is VISUAL ADVERTISING. I have used postcards, flyers, brochures and banners. You could use posters in the halls and the teacher workroom, an “ad” in the school newsletter, a video on CCTV morning news, posters at PTA meetings and more. Everywhere people you want to reach gather is an opportunity for you to give them something to LOOK AT that promotes the media center and the products and services you offer and pushes them to find how it benefits them. If they only knew what you offer, and how it would benefit them, they would take advantage of it! Next week, we will look at the second sticky way you can get the word out. THIS WEEK, ask to be included in the school newsletter and make it visual! I have booked almost 50 library visits this summer all over Georgia and Alabama. If you’d like to see what the programs I offer are like, check out my online calendar and find a show near you. I’d love to see you this summer! A Librarian by Any Other Name – CONTEST! Most of you know that my wife Linda is a media specialist. Prior to that she was a college English instructor and has always had a gift for helping writers find ways to effectively (and correctly) communicate. She once referred to herself, alliteratively, as the “Word Witch.” When I suggested she change that to “Grammar Goddess,” she quickly embraced the term and never looked back! That got me thinking about what people might call you, or what you might call yourself. I have heard or seen Library Lady, Guy-brarian (for our male colleagues), Information Diva, Media Maven, and Copyright Queen. So, here’s the contest. Hit REPLY and send me up to three of your favorite titles. These can be names you have been called or that you wish students or faculty would call you. I’ll compile the list (sans names) and my wife will choose her favorite. If more than one of you submit the name she chooses, the email with the earliest time stamp wins. Deadline is midnight EDST, Saturday, March 18, 2017. What’s the prize? A $25 Amazon gift certificate for YOU to use for YOU – not your school. Hit REPLY and give us your favorite librarian label. And remember – Linda Loves Alliteration! 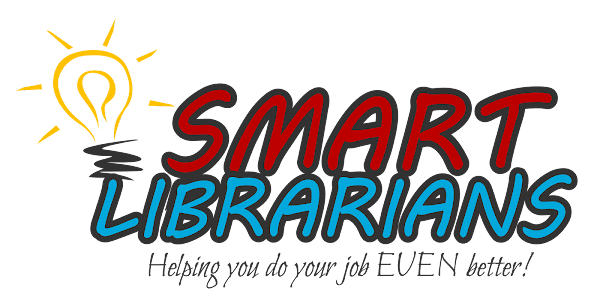 I’ll reveal the winner next week and will share your entries over the next few weeks in the Smart Librarian newsletter. We talked about everyone’s favorite radio station, WIIT-FM – What Is In This For Me? One of the best ways to answer that question is to present your media center resources in terms of BENEFITS and not FEATURES. Businesses struggle with this all the time. Features describe the “WHAT” of your library. Benefits answer the “SO WHAT?” Benefits solve a problem or answer a question. Feature: We have 9,000 nonfiction books in our media center. Benefit: Need an idea for the science fair? We have dozens of books that can help you find the perfect project! Ask Mrs. Read in the Media Center! Feature: We have our fiction books arranged by genre. Benefit: Love a good mystery? We have a whole section for YOU! Look for the blue spine label. If they only knew what you offer, and how it would benefit them, they would take advantage of it! More on this next week. THIS WEEK, make it your mission to find three ways to tell patrons about the BENEFITS of library resources! My good friend and fellow school show performer, September Cardiff, has written a couple of children’s books and needs an editor. I am an above average proofreader and my wife is great with grownup stuff, but this is a little out of our wheelhouse. Do you have the skillset to help or do you know anyone who could do this? Hit reply and let me know. Or if you want to find out more about what she offers, go to www.temberstales.com/events. And of course, you can contact her directly. Thanks! A Spaghetti Free Zone? That's what the sign said! Do not CHEW headphone cords. No food in the library. Food (and possibly violators) will be confiscated and fed to Cerberus, the three-headed dog who guards the entrance to Hades, located in the basement of the Evans building. We are temporarily closed for repairs. The good news is that we killed the Basilisk. Unattended children will be given a Red Bull and a puppy! Marketing is everything you do to place your products and services in the hands of people who would benefit from using them. To do this effectively, you need to communicate said products and services to the people who need them. That can be as simple as a posted list or as detailed as a library website. You can communicate it passively by posting a sign, or actively by asking for 5 minutes in every staff meeting. One of the most effective ways to do this is to meet your patrons at their point of need. When you know that a science unit on electricity is coming up, go to the grade level meeting or send an email to the teachers in that grade, telling them about the resources and services you offer through the media center. If they only knew what you offer, they would take advantage of it! THIS WEEK, make it your mission to find one problem your teachers face and show them how the media center can address it. It will be the best email they will get all week!